Today is another special day – it marks six years since Joshua popped the question. 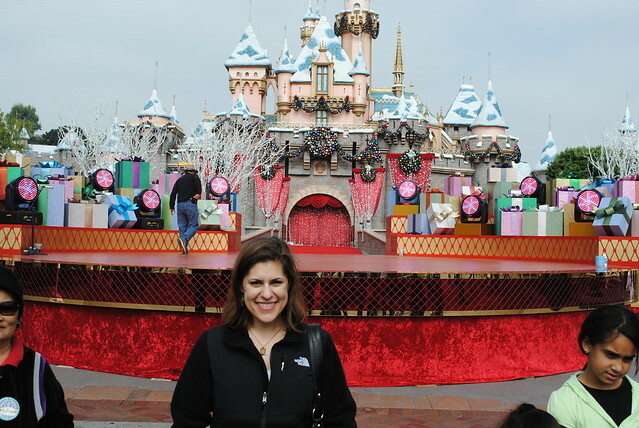 We’re getting ready to go to Disneyland next week, the same place where Joshua asked me to marry him. Here’s how it happened. Six years ago, Joshua and I were getting ready to celebrate our fifth anniversary of dating. When I asked him how we should celebrate, he suggested going to Disneyland. Immediately I suspected this would be where he planned to propose. I mean, how could I not? The man who always said, “I don’t know, what do you wanna do?” to everything had this idea to go to Disneyland? Okay! Thinking back on it now he was such a good sport! Not only did he have to endure endless sass from me but he was getting teased by his family. In September two of his brothers got engaged in the same week. At that point I was the only “girlfriend” in the family. Yeah, no pressure! Due to our schedules and the 6th being on a Friday, we weren’t able to have our day in the park on our actual anniversary. Instead, Saturday, November 7th was the day things happened. First off, let me just say that our anniversary weekend is the perfect time to go to Disneyland. The traffic is low, the weather is mild, and the longest time we had to wait in line for a ride was 20 minutes. Not only that, but they start filming parts of the Christmas Day parade, so there’s a good chance of a celebrity sighting or two. Throughout the day we hit up all our favorite attractions. At one point we hopped on the monorail and rode it around the park. By accident I bumped into Joshua the wrong way and felt something odd in his side pocket. I had a feeling this might be a ring, which made me super nervous since I had no idea how or when he was going to ask me. It also didn’t help that he sat in a way that looked like he was covering up a ring but playing it off as casual. I didn’t say anything, but I slyly snapped a photo of him trying to cover up the ring in his pocket. If he was in fact covering up a ring, which I was 95% sure he was, I wanted to remember this moment. 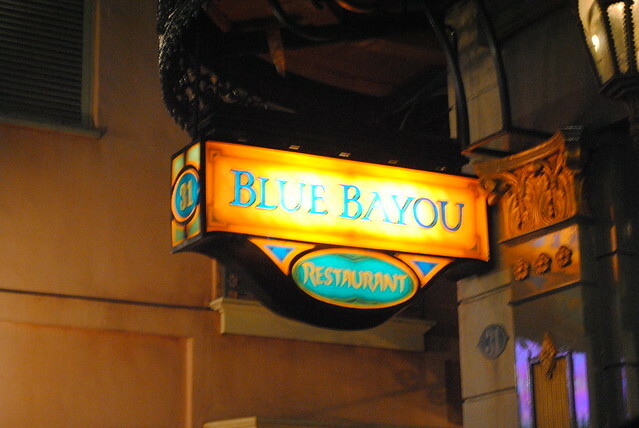 At 6pm we had dinner reservations at Blue Bayou. This is the restaurant inside the Pirates of the Caribbean ride. It’s really popular, so you have to book your reservation months in advance. It’s also on the pricey side, but it’s so worth it if you can go. We got a table right by the water, so we were able to wave to all the people passing by on the Pirates ride. After dinner, Joshua started to be his cheesy self saying how much he loved and how happy he was to be there with me. Then… he pulled out the ring. I asked, “Is this for real?” and he said, “Yes it’s for real. Cristina will you marry me?” Of course I started to cry, said yes, and put the ring on. I walked into the restaurant a girlfriend and walked out a fiancée. We immediately called our family to share the good news and of course, posted it to social media. 5 years ago Joshua asked me to be his girlfriend. Tonight he asked me to marry him. I'm engaged, and I couldn't be happier!! Next we went shopping for our pins. Joshua and I have a Disneyland tradition where we purchase a pin for our lanyards that symbolize our visit (we don’t do the whole pin trading thing). 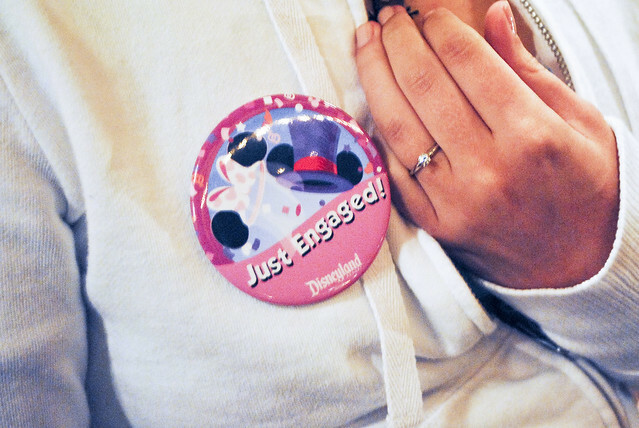 I happened to mention that we just got engaged to the saleslady so she hooked us up with some official Disney buttons for us to wear. And there you have it! 364 days later we tied the knot!